The poppets love bugs! Maybe it’s because they’re so small or because they make grown adults (like myself!) flee in terror. Either way bugs are a super popular topic in our family. So it was with much excitement that we entered the Melbourne Museum (with our colourful Very Hungry Caterpillar toy coming along too!) eager to attend the Australian premiere of Bug Lab: Little Bugs, Super Powers. Inspired by the secret life of bugs and their genius ways, Bug Lab: Little Bugs, Super Powers immerses audiences of all ages in a journey to zoom in on the world beneath your feet! The undeniably colourful exhibition features six large-scale bugs – Orchid Mantis, Bombardier Beetle, Jewel Wasp, Dragonfly, Japanese Honeybees and Katipō. These special bugs have evolved over millions of years to have superpower-like abilities, including camouflage, mind control, super speed, swarm intelligence and deadly venom! 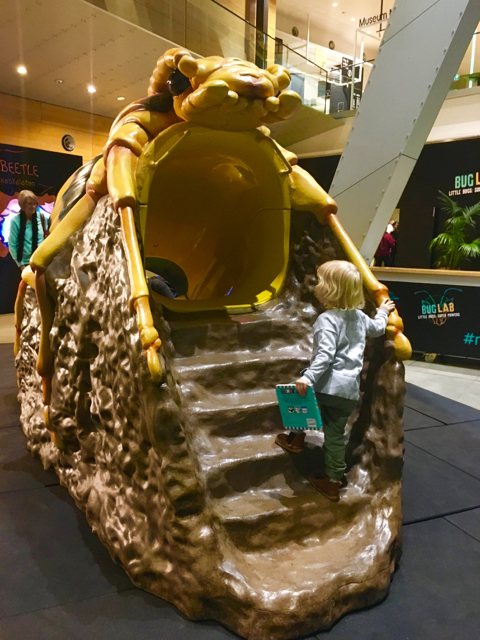 With four immersive chambers, dozens of interactive experiences and activity tables, the poppets had an un-beetle-ble time exploring the exhibition. Arlo particularly loved testing his reflexes hitting bugs as quick as an Orchis Mantis and performing brain surgery on a cockroach (eek!) while Miss Macy loved using the magnifiers to see the real specimens up close and had many visits to the Dragonfly zone where she stood mesmerised by one of the best flyers in the world. Older children and adults will enjoy the fascinating science content and with more than 2,000 individual pieces that took almost 200 technicians over 40,000 hours of work over six months. This is an exhibition which goes far beyond the realm of a regular natural history exhibition. Bug Lab: Little Bugs, Super Powers offers an amazing interactive experience for all ages and with a range of bug-tastic activities these school holidays, I know one family that will be sure to be returning to Melbourne Museum! Oh and did I mention the beetle slide which has coloured lights AND sound effects! Yippee! Book tickets online to make sure you don’t miss out. Beware that the exhibition space is quite dark + combined with a few crazy looking bugs and loud sound effects, it may be a bit scary for little ones. The exhibition is pram friendly with allocated pram parking if required. Not done with little critters? In partnership with Bug Lab: Little Bugs, Super Powers, Melbourne Museum’s IMAX theatre is screening Bugs: Mighty Micro Monsters 3D or visit the Melbourne Museum’s permanent exhibition Bugs Alive! to get up close and personal with the real thing – live insects, spiders, snails and other invertebrates! If your little ones need to burn off some energy before or after visiting Bug Lab, pop into the Melbourne Museum’s new Pauline Gandel Children’s Gallery. Read our review here. Have you entered our Bug Lab giveaway, we have 6 family passes to giveaway - be quick it ends very soon! Here's the link. For more information on Bug Lab and to book your tickets, head to the Melbourne Museum website. On until 15th October 2017. To follow Kate and her poppets around Melbourne, head to her Instagram page.